Perfect Score Technology Center (PST) fabricates high speed waterjet systems for soft material cutting applications. The use of Linear Drive motion systems yield speeds exceeding 3000 ipm with exceptional accuracy. 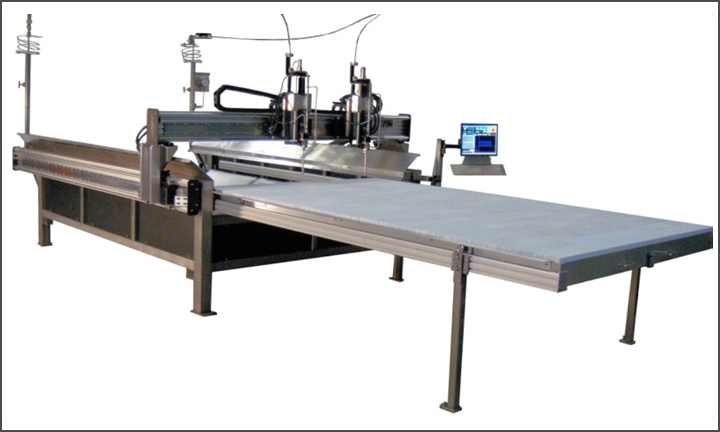 Typical systems features include multiple cut heads with integrated shuttle bed or conveyor systems. •	Systems up to 6 adjustable cut heads. •	Automated hold down arms for curved soft materials. •	No motion backlash yielding consistent round cutouts.